Nostalgia swirls in the September air like leaves on a breeze. Maybe it’s the back-to-school vibes that are forever in my heart or maybe it’s the cooler air and darkening days – whatever the cause, I find myself taking stock of life when summer comes to an end. It is a good time to reflect, especially as a gardener, since the maintenance has subsided to a reasonable level (until we take the gardens apart in October). Gail, Joe, and I have recently begun the process of evaluating the gardens this year. We discuss what we liked, what we didn’t, where we could have used more or less plants, where we wish we had more color, etc. It is also this time of year when we begin to find inspiration for next year’s gardens. It feels a little crazy, but back in August when it was 95 degrees and humid, we spent time deciding on spring’s tulip combinations. Nothing like thinking of spring when the air is heavy and the sun is brutally hot. (If you are hoping for a teaser of our choices, you’ll just have to visit next spring to see the gardens for yourself!) Oddly enough, soon we will have to make decisions for next year’s dahlias, too. 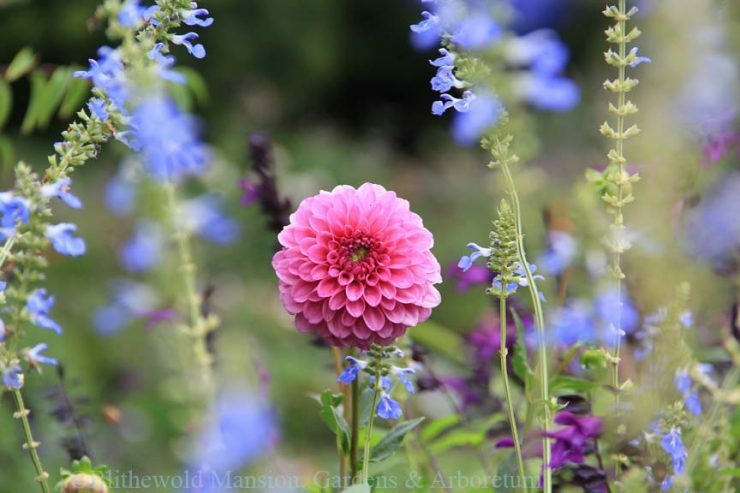 I love many of the dahlias we tried this year (see the featured image above for one of the gorgeous dahlias in the Rose Garden), so I am excited to see what will be available for next year. 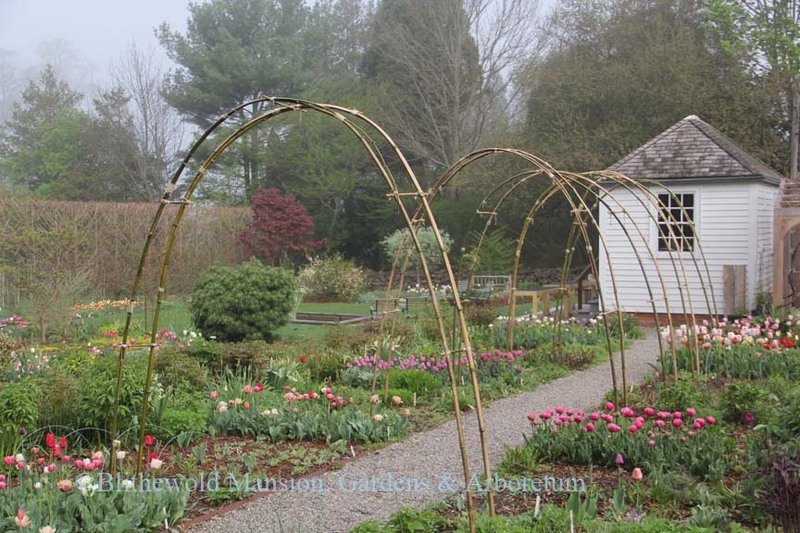 I want to end with a reflection on one of our big hopes this year: the arches in the Cutting Garden. Here they are this past May awaiting their future glory. The dream was to have bamboo arches full of blooms that would envelope visitors in a flowery, enclosed pathway. 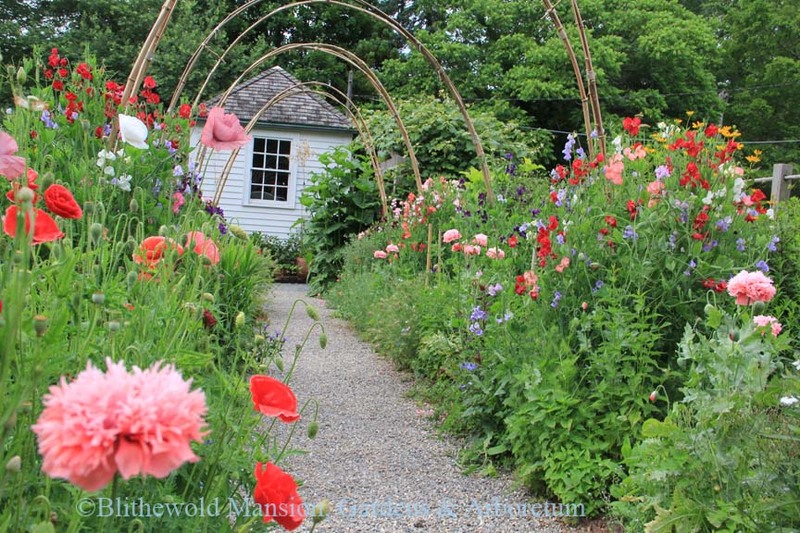 We planted sweet peas on the arches in April and they rewarded us with some lovely and fragrant blooms in June. 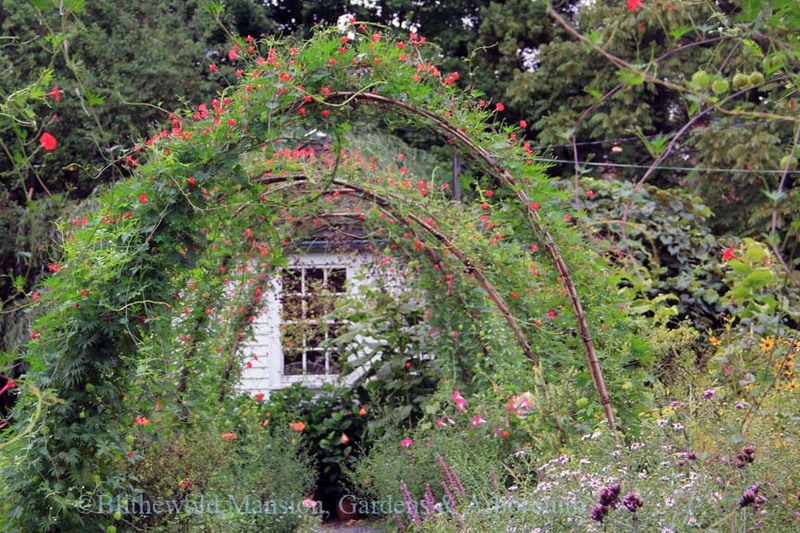 (To see more about the arches and the sweet peas that we grew there this spring click here) Once the sweet peas passed their prime (they held on beautifully until mid-July! ), we planted heat-loving vines. The arches are now full of the jewel-red flowers of cardinal climber (Ipomoea x multifida) and pretty balloon-like seed casings of love in a puff (Cardiospermum halicacabum). I started these vines from seed on June 1, Gail and Joe planted them in the garden the third week of July, and here we are in beautiful September experiencing the dream Gail had in January. It has come full circle. It is fun to reflect on a dream when everything works out just as we hoped. Perhaps I’ll illuminate more of our garden evaluations in the coming weeks. For now, come visit and experience the gardens in their autumn glory!